1/18/18 - Fabric Sale extended until the end of January! January Fabric Sale extended until the end of the month! The Quilted Crow is having a January Clearance Sale which will now end on Wednesday, January 31st. Help us make room for the new collections arriving this year! Select bolted fabric will be on sale from 10% to 50% off the regular prices! Learn the technique of needle-turned applique' and create this 20" square sample which can then be made into a throw pillow or wall hanging. This class is hand applique' only and you will complete the project at home. Therefore, no sewing machine will be required for the class. You will only need a quarter yard or fat quarter of the contrasting and background fabrics and scraps from your stash for the applique'. Pattern shapes will be provided in class. A complete Supply List for this class will be provided upon registration. Class Fee: $20, pattern and other incidentals will be supplied in class. To register, please click HERE to visit the sign-up page on our website. You may also sign up over the phone by calling the shop at (610)900-4700. For those who weren't aware of the situation, the Dark and Light colorways were sold out before we had a chance to order and a third Pastel colorway was offered in its place. Due to the unexpected popularity of this program, we were also shut out of the Pastel colorway. 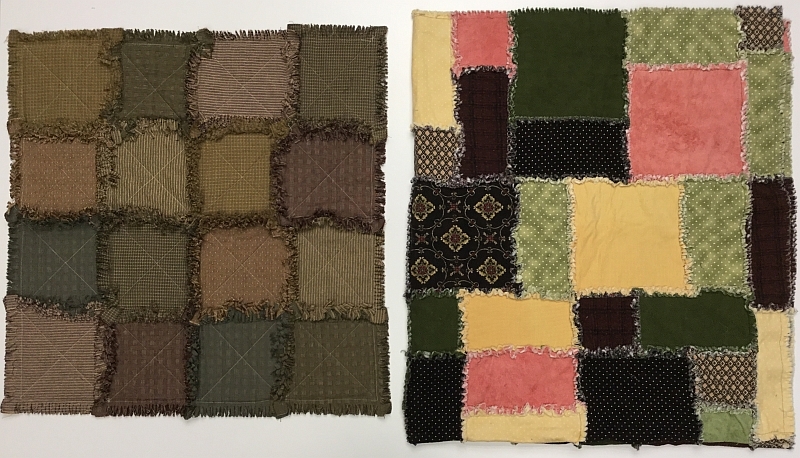 We've received an email from Free Spirit Fabrics stating that they will again be manufacturing the fabrics for the Mystery Quilt program, in all three colorways, but the fabric will not be available for shipment until August. If you wish to participate in the program, you will be receive the first 6 months of fabric with clues (March-August) in August instead of receiving one per month beginning in March. Please let us know if you are interested in participating in the program with the new distribution schedule by no later than this coming Tuesday, January 23rd, at noon so we can place our order and ensure that we're not shut out again. You'll also need to tell us which colorway you'd like, as all 3 (Light, Dark or Pastel) will again be available. The cost to participate in this mystery puzzle adventure is $175 which includes the cost of the 12 yards of fabric needed to make the entire quilt top. We have a local gentleman who owns two vintage quilts which are in need of repair. Crow Sew - The next scheduled meeting at the Crow will be on Wednesday, January 31st, 2018 at 10am.